The Solvit Bedside Wood Pet Ramp is perfect for any size pet, who is unable or unwilling to use stairs and need extra assistance to access a bed. The ribbed carpet walking surface provides a sure safe footing. 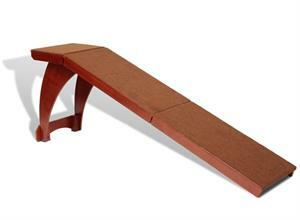 The ramps real wood and rich cherry finish makes this complement any bedroom decor. The generous landing area at the top of the ramp, provides confidence in moving to and from the bed. The Solvit Bedside Wood Pet Ramp is long enough to provide a gentle climbing angle, but still fit alongside a queen-size bed, even with nightstand in place.